You are currently browsing the tag archive for the ‘Apis’ tag. It’s the last ride of the Libellule, Pierrot’s and Psi’s little spaceship, and the last flight of our heroes as a team. What should have been a routine flight, turns into disaster, when our heroes encounter enormous space vessels, which together are able to destroy complete planets (similar to the Death Star in ‘Star Wars’ from 1977). Composer Michel Legrand enhances the menace of these weapons of mass destruction by accompanying the images with a repeated, uncanny electronic riff. When intercepted by space ships, the Libellule crashes on the planet Apis, where Psi is captured by the very humanoids she had encountered in ‘Les anneaux de Saturne‘. 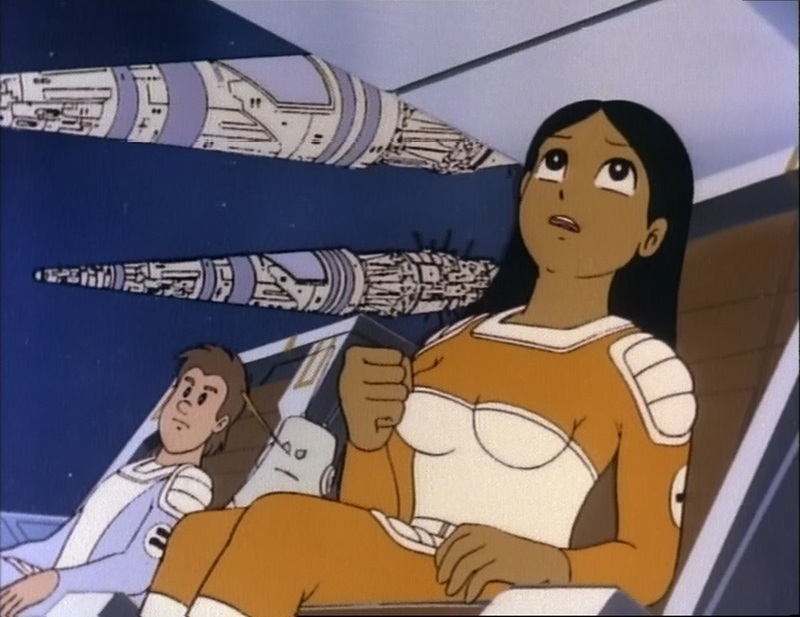 While she is taken to the neighbor planet Yama, Pierrot joins a rebel group of humans fighting the humanoids, and two of them, Sylva and Gillio, join him and Metro on a journey to find one captain Murdock, the only one on Apis that owns a spaceship. In ‘Les humanoïdes’ the mysterious ally of Cassiopeia, Yama, reveals itself. It turns out to be a whole planet of humanoids, controlled by a supercomputer. In fact, Yama is behind every robot-involved scheme in the entire series, as they will reveal later. ‘Les humanoïdes” is the first episode of the six-part mini-series within the ‘Il était une fois… l’espace’ that constitutes its great finale. This finale in particular elevates the series above average, giving this series its extra grandeur. Barillé himself must have seen their potential, as these episodes were modified into a feature film called ‘la revanche des humanoïdes’ (Revenge of the Humanoids) and released later that year.